Give your dog the vacation it deserves… at a country club for dogs! With a variety of room types to choose from, it’s pawsome! While you’re away let your dog play! Our daily schedule promotes socialization and exercise to poop out your pooch! A clean dog is a happy dog! 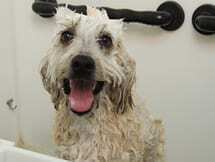 A splash-n-dash spa treatment pampers your pet from nose to toes.